Used to wear long socks in vibrant colors just for fun at the gym. 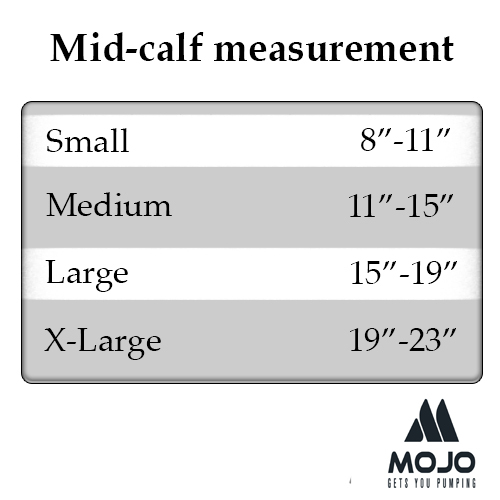 However, after a calf injury, a physical therapist suggested real compression sleeves. I have tried several brands from the ridiculous to the sublime. Have been using Mojo exclusively now for over a year; for me, they have the desired degree of compression. Although originally bought for running, I now also use them on the elliptical and for stairclimbing. Since I exercise 6 times a week, I have every single color to suit my mood. I re-order about every 3 months mostly out of paranoia; just cannot risk another calf injury. I just wish Mojo would make bright yellow sleeves! I love these Mojo sleeves! I wear compression stockings for a vein circulation problem, so I need to wear them every day, all day long. I love sleeves in summer, so my feet are bare. These sleeves fit me perfectly (size small for a 5'1" woman), and give just the right compression to support my leg veins. I love the bright colors. I have Mojo sleeves in all the colors. They last through repeated washings and wearings, too. If they work for me, they will also be great for runners. I highly recommend them. Love these calf sleeves. So much more comfortable than the socks. For me, having my toes in any kind of compression hose or socks is very uncomfortable. These are the perfect answer. Tried one pair and loved them Ordered another! Thank you Mojo!